I recently came across a news item that the Indian Space Research Organization (ISRO) has traced the map of the mythical river Saraswati through the use of satellite technology. On the basis of this report I applied to them under the Right to Information Act to supply me a copy of that map. 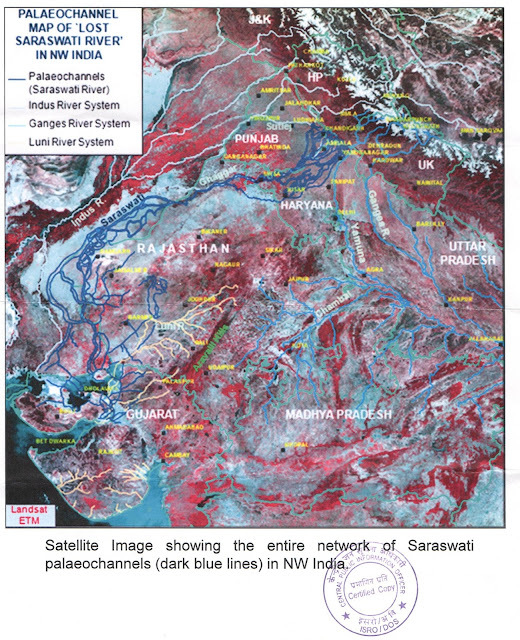 Sure enough I am in receipt of that map, which clears shows the entire map in which River Saraswati flowed. This includes the inception / sources of the river to its culmination. In as much as I feel that like me many other fellow Indian and for that matter even those foreign to India would be interested in having a look at the map, I am sharing it on this platform. The map shows River Saraswati in dark blue colour flowing from East to West cutting across the north Indian plains after originating from the icy himalayas and flowing towards the current Gujarat. The map has been certified as correct by ISRO. A lot of stories / fables revolve around this River Saraswati and the most recent bestsellers (Shiva Trilogy by Amish Tripathi and The Krishna Key by Ashwin Sanghi) also make a reference to this River. Hindu Mythology also believes that this river meets River Ganga and River Yamuna at prayag in Allahabad.